Home >> Articles >> 2010, The Year of the Tiger - Happy Chinese New Year! 2010, The Year of the Tiger - Happy Chinese New Year! The Chinese year 4708 begins on February 14, 2010, the year of the Tiger, with its association to bravery. This year, the date has special significance since it also happens to fall on Valentine's Day, making it a doubly auspicious day to celebrate in the West. The Chinese year 4708 begins on February 14, 2010. According to the Chinese zodiac, it will be the year of the Tiger, which is associated with bravery. This year, the date has special significance since it also happens to fall on Valentine's Day, making it a doubly auspicious day to celebrate in the West. Chinese months are reckoned by the lunisolar calendar, in which each month begins with the new moon (when it is darkest). New Year festivities traditionally start on the first day of the first month - usually the second new moon after the winter solstice - and continue until the fifteenth, when the moon is brightest. In China, people may take weeks of holiday from work to prepare for and celebrate the New Year. The year 1 on the Chinese lunisolar (not purely lunar) calendar corresponds to the first reign year of Emperor Huang Di (the "Yellow Emperor"), who is said to have invented the calendar during the 61st year of his reign. If you were born during one of the following Chinese calendar years, you were born under the sign of the tiger: Jan 26, 1914 - Feb 13, 1915; Feb 13, 1926 - Feb 1, 1927; Jan 31, 1938 - Feb 18, 1939; Feb 17, 1950 - Feb 5, 1951; Feb 5, 1962 - Jan 24, 1963; Jan 23, 1974 - Feb 10, 1975; Feb 9, 1986 - Jan 28, 1987 and Jan 28, 1998 - Feb 15, 1999. Considered to share tiger traits, among Chinese zodiac signs you are one of the most caring and thoughtful. You have a lot to say on the best way to right society's wrongs, and are quite capable of defending children, friends, and loved ones against all enemies. Tigers are also said to be lucky, vivid, lively and engaging. For the tiger in 2010, any recent setbacks or obstacles can be overcome, so look forward to a year in which to really shine, either personally or professionally. The Tiger is the proverbial King of the Jungle (lions aren't native to China) and is admired for its vivid stripes, which symbolize the balanced forces of 'yin' and 'yang'. One of the most dynamic signs in the zodiac, tigers are truly a force of nature. They are by turns dependable, unpredictable, fearless and stout-hearted, tender and loving. Appearing at times to be quiet homebodies, tigers may suddenly change course and pack up to travel to some far-flung exotic destination. As a result, they may sometimes be perceived as irresponsible. This is because few other signs can keep up with the tigers' ability to think on their feet, or their primal desire for adventure and first-hand experience of life. In family relationships, tigers are extremely protective and will strike out at any perceived threat to home or children. In business and personal relationships, their air of charismatic authority often commands respect. However, their regal attitude may sometimes turn into a firm belief that they know what's best for everyone, and they may sometimes descend into stormy moods of retribution if they fail to get their way. At such times, standing up to a disgruntled tiger is the quickest way of earning their admiration — just be ready for a battle royale! Tigers can never sustain their fury for long, however, and if you can ride out the storm, then surely peace will reign again. March is the month of the tiger. The time of the tiger is from 3:00 a.m. to 4:59 a.m. Their direction of orientation is east-northeast. The Tiger's color is green. 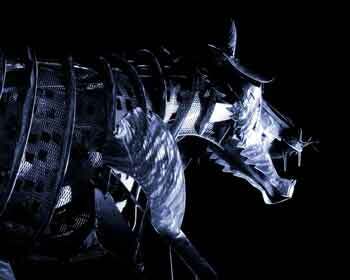 2010 is a Year of the Metal Tiger, traditionally associated with massive changes and social upheaval. It is very likely to be a volatile year, both on the world scene and on a personal level. Tigers, who thrive on chance and unpredictabilty, are best suited to navigating the many upheavals predicted in the year ahead. Those compatible with the tiger — dragon and horse in particular — may also find 2010's erratic circumstances inspiring them to ever bolder action, and ultimate success. Those born under other signs may suffer, by degree, depending on how flexible they are to change. Those who can keep a steady hand on the helm may be shaken, but should remain undeterred by the typically thunderous events foreseen in any Tiger year. Typical Chinese greetings at this time include 恭喜! ("Congratulations" - as if to say 'you made it through another winter! '; pinyin: Gōngxǐ! ), 恭喜發財! (same as "恭喜!" but with the added wish to "Get rich! "; pinyin: Gōngxǐ Fācái! ), 新年好! ("Good New Year! "; pinyin: Xīnnián hǎo! ); 新年快樂! ("Happy New Year! "; pinyin: Xīnnián kuàilè! ); 新春快樂! ("Happy New Spring! "; pinyin: Xīn chūn kuàilè!) and 春節快樂! ("Happy Spring Festival! "; pinyin: Chūnjié kuàilè!). 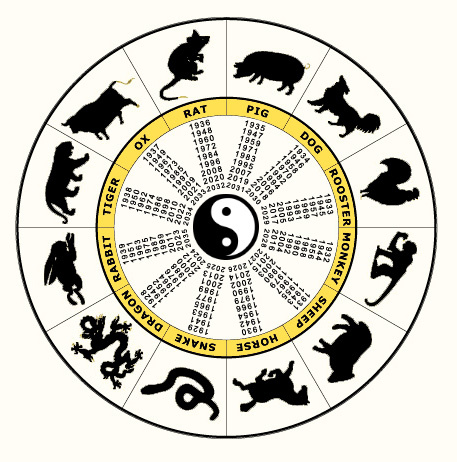 Most people who know anything about Chinese New Year know about the cycle of twelve animals that begins with the rat. A lesser known cycle is that of the five elements (五行; pinyin: wǔ-xíng): wood (木; pinyin: mù), fire (火; pinyin: huǒ), earth (土; pinyin: tǔ), metal (金; pinyin: jīn) and water (水; pinyin: shuǐ). The combination of elements and animals produces a 60 year cycle, so that a 60th birthday is special cause for celebration (such as Dr. Yang's in 2006). Behind the elements and animals is a system of timekeeping involving the ten "heavenly stems" (天干; pinyin: tiāngān) and twelve "earthly branches" (地支; pinyin: dìzhī). The heavenly stems (甲乙丙丁戊己庚辛壬癸) correlate to the five elements (two per element, in the order wood, wood, fire, fire, earth, earth, metal, metal, water, water). The twelve earthly branches (子丑寅卯辰巳午未申酉戌亥) correlate to the twelve zodiac animals (in order: rat, ox, tiger, rabbit, dragon, snake, horse, ram, monkey, rooster, dog, pig). This year's stem and branch are 庚 (pinyin: gēng) and 寅 (pinyin: yín), respectively. Another lesser known aspect of Chinese astrology is that the years alternate between yin (陰; pinyin: yīn) and yang (陽; pinyin: yáng). Because there are an even number of zodiac animals, each animal is considered either yin or yang. At Chinese New Year celebrations people wear red clothes, decorate with poems on red paper, and give gifts of "lucky money" in red envelopes. Red is associated with fire, which is thought to drive away bad luck. In China, the New Year is a time of family reunion. Family members gather at each other's homes for visits and shared meals, most significantly a feast on New Year's Eve. During early periods of migration to the United States, many Chinese immigrants arrived without their families and found a sense of community through neighborhood associations instead. Today, many Chinese-American neighborhoods host New Year's banquets and other events. In some areas of China it's a popular custom to give oranges because in Chinese, the word "orange" sounds like another word which means "good luck". People present oranges to their friends and relatives to express their respects and good wishes for the coming year. Chinese New Year ends with the lantern festival on the fifteenth day of the month. People hang glowing lanterns in temples, and carry lanterns to an evening parade under the light of the full moon. Some lanterns are works of art, painted with birds, animals, flowers, zodiac signs, and scenes from legend and history. The lantern festival celebrations often culminate with a dragon dance and fireworks. You are reckoned to be compatible with persons born in the year of the Horse, Dog or Dragon, and should avoid persons born in the year of the Monkey or Rabbit. Famous Tigers: Sun, Yat-Sen, Tom Cruise, Queen Elizabeth II, Emily Dickinson, Isadora Duncan, Dwight D. Eisenhower, Marilyn Monroe, Marco Polo, Beatrix Potter, Karl Marx, Ludwig van Beethoven, and Jon Stuart.